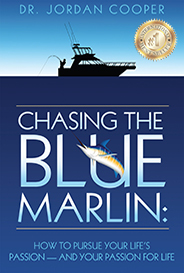 Dr. Jordan Cooper’s new book, “Chasing the Blue Marlin,” is now available on Amazon! Within these covers, Cooper deftly weaves personal stories with philosophy and entrepreneurial smarts to help you become the best version of yourself you can be — a passionate person that you are proud of. With Cooper’s help, you will learn to set better goals, achieve those goals, and explore your way of life so that all of your actions, entrepreneurial or personal, will be aligned with your core values. You’ll push your boundaries, break free of past failures, find ways to create success for yourself, and even learn some physical fitness as you strive to take hold of all that life has to offer you. DR. JORDAN COOPER, CHASING THE BLUE MARLIN. ALL RIGHTS RESERVED. SITE DESIGNED BY THE ARTIST EVOLUTION.